(4) Process for volunteering - Fill in application form (below) and take to the Blakenall Village Centre when you visit. One of the corporal works of Mercy is to feed the hungry - "For I was hungry and you gave me something to eat" (Matt 25:35). The Corporal Works of Mercy are part of the teachings of Jesus and give us a model of how we should treat others, as if they are Jesus in disguise. They are acts of charity that meet the human bodily needs of our brothers and sisters as we journey together through life. 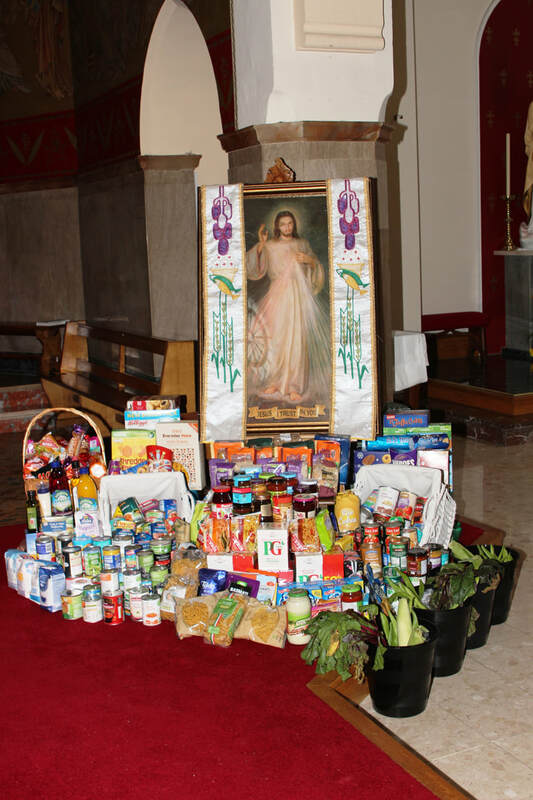 At Saint Peter's we celebrate Harvest Festival. During this time we give thanks to God for the food that keeps us alive. Few people nowadays are aware of this custom because food is so easily available all year round from supermarkets. This forgetfulness means we do not think about all the time and work that goes into producing food or even people who do not have enough food. The Bloxwich and Blakenall Food Bank is in need of volunteers to help with the upcoming collection. If you can spare a few hours please sign-up using the form below to help local people in crisis (see also Volunteer Descriptions). ​If you can please bring some food and put in the boxes at the back of Church. These are regularly emptied to take to the Food Bank at Pelsall Methodist Church, Chapel Street, Pelsall, WS3 4LN . Please visit the Walsall Food Bank website for more information. ​Urgently needed items: rice pudding/custard, tinned fruit, pasta/curry sauce, tinned tomatoes, biscuits, tinned meats, pasta/rice, long life fruit juice. The Trussell Trust has a 400-strong network of foodbanks provides a minimum of three days’ emergency food and support to people experiencing crisis in the UK. In 2016/17, they gave 1,182,954 three day emergency food supplies to people in crisis. The foodbanks are projects founded by local churches and community groups, working together towards stopping hunger in our local area. There is a plan to establish a Food Bank in Bloxwich. See Sue Kennedy for more details.